Apologies for the delay in responding, we got back very late form North Wales yesterday, trying to top up with caffeine to help the recovery!! I really cannot thank you enough, the choir was so professional and sounded absolutely stunning. I’ve found you the most well organised choir I’ve worked with to date and an absolute pleasure to have at the event. Please do pass on my thanks to all of your choir and especially your pianist who saved me last minute with my hymn music!! What a star!! Emily Foster | Event Logistics Manager | RNLI, West Quay Road, Poole, Dorset. On behalf of Rhyl Lifeboat Crew, I would just like to thank Acquire-Choir for singing at the recent Naming Ceremony of our new Inshore Lifeboat, ‘Mary Maxwell’. Your presence and performance added a lovely touch to what turned out to be a very enjoyable day. Many thanks to all of the choir. Darrel Crowther, Operations Manager, Rhyl Lifeboat Station. I’m just writing a quick note to thank-you for the part you played in making Sunday night’s service such a moving and fitting occasion. It was good to see so many folk there, and able to engage with the content of the service, something that was particularly evident whilst you were singing. I know from my own experience when you’re in a big acoustic it’s hard to know what it sounds like because each person sounds like they’re singing by themselves – from where I was sat I was so impressed with how you sounded together and size of the noise you were able to make to fill that place! And that’s just your music – you brought much more than that too. Thank-you. So on behalf of cytun, the churches together in Rhyl, please do pass on my thanks to everyone in Acquire, and I wish you well in all that you look to achieve and accomplish in the coming year. Just wanted to drop you a line to say how much we enjoyed the ‘Jazz Choir’s’ concert a the Beaches Hotel Prestatyn. Pitch perfect harmonies, spot on timing and creditable solos had the whole audience tapping their feet with the first song and it just got better after that. What a buzz, we all loved it! If the choir I sing with could perform half as well as your team we’d be out looking for a professional agent! Many thanks for a delightful and enjoyable evening. I just wanted to say how fantastic you were tonight at St Mary’s Church in Rhuddlan. Your Jazz section was fabulous and it really got people tapping their feet! All the soloists were superb and your version of Toto’s ‘Africa’ blew me away! Lots of people were wiping their eyes during ‘You’ll Never Walk Alone’ and I must confess I left the church with a lump in my throat! Well done everybody :). Can I say a big Thank you to all the choir. You really made our last Light up a Light service at Christ Church Rhyl such a success. St Kentigern Hospice are proud to work with you and appreciate your support. What a memorable musical evening at Rhyl’s Little Theatre last night. It was also an emotional evening as feelings of support, friendship and love filled the stage and flowed over to embrace the auditorium. This was truly a wonderful community experience. The singing was joyous and inspirational, the harmonies achieved were glorious. The programme was varied and well balanced including memorable solo and duet performances. This was a show with a five star feel good factor. Keep up the good work. We were so grateful to you for bringing Acquire along to the Chapel Opening on 16th November. The performance was stunning and a huge success. It was also for us the best possible test of the acoustics of the Chapel. I stood at the rear of the hall and the clarity of the singing was as near perfect as it could be. Without exception everyone I spoke to at the event was thrilled with the performance and the variety of material sung. We are ever so grateful to you for taking the trouble to bring the choir to the Chapel and are looking forward to seeing and hearing them again at some stage in the future. 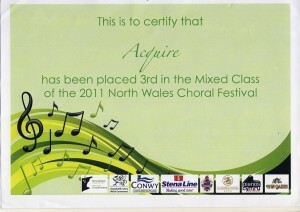 Thank you for your recent donation (£1250.00) raised by your concert at the Theatr Twm o’r Nant, Denbigh. Thanks to gifts like yours, we are now able to reopen our doors to day patients every Tuesday after having been closed on Tuesdays since the financial crisis hit the hospice two years ago. Tuesday will be a psychological therapy day which will incorporate anxiety and mood management courses for those patients who are being treated for a life threatening illness. We can also continue to deliver specialist palliative care to patients in the Inpatient Unit and support for their families through our highly skilled nursing team. Whilst the care we provide is free, it is not without cost and would not be possible without your generosity. I would like to thank Acquire for supporting Buzz-AH! by taking part in the ‘Grand Night for Singing’ concert at the Stiwt last Saturday night. It was greatly appreciated. It was nice that we were able to share the same stage to perform and to meet some more of Acquire members. It was a tremendous team effort by all involved and was a concert that everyone enjoyed. Thank you so much for coming to St Thomas’ Church Jubilee Party and entertaining us absolutely wonderfully. Everyone thought your singing and arrangements were superb and as we had not told everyone you were coming it was such a lovely surprise. We wondered if you could let us know where you are singing next. We would like to follow you, you are so good!! All power to your elbows and once again, thank you.